Saunas have evolved tremendously over the years and have developed into highly technical, luxurious amenities. With the advancement of efficient energy, saunas are no longer limited to the wood burning models of the yesteryears. With the use of infrared technology, you can now install a state-of-the-art, highly efficient sauna in your home and begin living in luxury immediately. Infrared saunas are comprised of infrared heaters that emit a powerful light which is experienced as radiant heat by the bather. As you sit in your new sauna, radiant heat caused by infrared light is absorbed into your skin, thus creating a hot, relaxing sensation. Infrared saunas function differently than traditional saunas. Traditional saunas operate similar to an oven and heat the body primarily by convection from heated air and by radiation of the heated surfaces in the sauna room. There are a wide variety of benefits associated with infrared saunas that make these amenities so popular among homeowners. For one, infrared light is very powerful and is able to penetrate your skin with ease. This factor is important for those seeking therapy for painful joints and bones. In addition to its overall strength, infrared saunas are known to produce anti-aging health benefits and promote healthy skin with its users, making these amenities one of the most sought-after alternatives for healthy living. Detoxification: It’s no secret that harmful toxins naturally build-up in our bodies over time, and that these toxins are widely responsible for various illnesses and an unhealthy state of being. Saunas are an excellent option to consider if you’re serious about your health and you want to detox your body of hazardous chemicals. Moreover, sauna detoxification can be used to relieve symptoms associated with common illnesses, prevent future illnesses, and increase your quality of health. Since infrared saunas are better able to penetrate your skin, they’ve been proven to be a better option for detoxification and for those who are conscious of their health. Pain relief: Due to the absorbing high heat through infrared rays, infrared saunas are the quintessential antidote to tired, sore muscles. Recent studies have concluded that people who experience chronic pain were reduced to a level of comfort after their first session of infrared sauna therapy. Overall pain levels decreased dramatically and remained low throughout the observation period. Researchers went on the record to state that infrared heat therapy is extremely effective for chronic pain treatment. Low blood pressure: Extreme heat from infrared saunas allow for deeper sweating which ultimately increases your blood flow, reduces blood pressure to healthy levels, and assists blood circulation. Recent medical researching has concluded that a regular infrared sauna regimen is an excellent method to maintaining good blood pressure levels and keep you out of the doctors office. Weight loss: Scientific studies reveal that within a half hour of sitting in a sauna your body burns an average of 40-80 calories. While that isn’t as high as running a few miles or engaging in more physical activities, it’s not so bad for merely sitting and relaxing! While saunas aren’t typically the best weight loss alternative on the market, pairing physical activities with regular sauna use is a an excellent choice if you’re looking to tone your body. Relaxation: If you ask anyone about saunas, the first thing that they’re likely to mention is the extreme relaxation that is experienced as a result of sauna bathing. Traditional saunas generally operate at higher temperatures while infrared is more soothing and gentle. Because of this, the level of relaxation tends to be more favorable to infrared saunas than traditional models. While infrared saunas are typically a very beneficial amenity to have in your home, there are a few potential risks that may arise as a result of improper use or non ideal conditions. In this section we’ll take a look at several pitfalls to avoid while using an infrared sauna and help you and your family relax and enjoy your new addition in complete safety. Just like driving a car is a luxury, poor decision making is a reality that can easily create unnecessary danger. You should never drink and drive as that will ultimately lead to disaster. Same goes for infrared sauna bathing. Drinking alcohol dehydrates your body and entering a sauna already dehydrated is the perfect recipe for causing harm to your body and passing out. There are several factors to avoid and consider before entering a sauna. In order to fully understand how to safely operate a sauna, let’s take a look at a few guidelines to ensure optimal bathing conditions. Overheating: This is a reality that can affect anyone, even those who are healthy. All it takes is staying in for a few minutes too long until you’re eventually nauseous, or even worse – passing out in 180 degree conditions. While incidents in saunas are rare, they are essentially very powerful machines that should be treated with the utmost respect. The good thing is overheating will almost never take place without warning; your body will let you know. If you feel any signs of dizziness, nausea, or feel weird in any way – exit the sauna immediately. Dehydration: Always be sure to drink lots of water and electrolytes (gatorade or powerade will suffice) before, during, and after sauna bathing. Experts and doctors have suggested to consume at least a ½ cup every 15 minutes, and to always enter a sauna properly hydrated. At no circumstances should you drink alcohol before entering a sauna. Soda and similar sugar-filled drinks and food should also be avoided to ensure you stay hydrated. Scientific studies have concluded that until puberty, children are unable to regulate their body temperature through perspiration as efficiently as adults. Doctors have went on record to state that children under 12 years of age may be vulnerable to potential heat-related effects from the sauna. This doesn’t mean that they aren’t allowed in a sauna, however their sauna bathing time should be supervised by an adult and limited to ensure overall safety. Since temperatures reach extremely hot levels, there are several objects and surfaces that can cause burns to your child. As a result, children under 12 years of age should never be left unattended in a sauna. In the case of infrared saunas that aren’t as extreme as traditional models, children are slightly less likely to experience injury or heat-related effects, however this does not make them exempt. As a parent, we strongly recommend that you use common sense and good judgement with your children while they use a sauna, and never allow them to endure lengths of more than 10 minutes per sitting. Infrared Sauna Reviews – What’s Trending These Days? Now that you have a better understanding of infrared saunas, let’s take a look at a few of the most popular choices among consumers today. 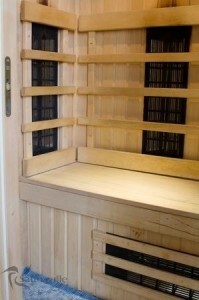 The Saturn 4 person corner infrared sauna is the definition of luxury. This beautiful sauna is a spacious and comfortable retreat from your busy day. This sauna seats up to 5 people. With 2 5 foot benches there is room enough to lie down or stretch. Complete with 12 Biophotonic Nano-carbon heaters, chromo therapy lighting, radio featuring AM/FM Radio with CD and MP3 input. With our Easy clasp design assembly takes only an hour. You must have a minimum of 6″for assembly. 24″ space above the sauna is recommended for roof access. This sauna is perfect for homeowners that want the luxury benefits of owning a sauna but have limited space inside their home. It’s slim design, lightweight build, and quality material make this infrared sauna a very popular option among homeowners. If you’re looking to get the most bang for your buck, you won’t regret having this beautiful amenity installed in your home. If you’re searching for an excellent quality sauna and don’t want to break the bank, the Radiant Sauna 2 Person unit is the ideal choice for you. This sauna comfortably sits 2 people; perfect for you and your significant other. Furthermore, it is equipped with luxurious features to add to your already relaxing experience. Radiant Sauna is a highly recommended brand and offers a wide variety of options that can be suitable for everyone. Whether you’re looking to relax and enjoy a quick therapy session or indulge in quality time with a companion, the Better Life Premium BL6235 3 Person Infrared Sauna is the quintessential addition to your daily routine. This sauna is beautifully constructed with ceilings over 6 feet tall and a clear glass window and door for a optimal space, this corner sauna has comfortable seating for up to three people. Are you shopping for the perfect sauna for you and your family? The Crystal Sauna 4 – 5 person infrared unit encompasses quality features and the capacity that are ideal for groups of friends or large families. With 12 carbon heaters and 24 inch benches, this sauna packs the heat to comfortably accommodate any group and offers relaxation and luxury that is second to none. If you’re in the hunt for the ultimate experience of luxury and sophistication, you need to consider the SaunaMed Luxury Cedar Sauna. With it’s gorgeous looks and unparalleled levels of relaxation and elegance, this gorgeous amenity will add a sense of charm to your home and have you living in high-class.